The workman across the street from us is a fan of ‘70s music. He’s got Janis Joplin and Credence singing so loud I feel like I’m in the shower with them – which is fine with me. It’s nice to be someplace where a workman feels like he can whistle or sing along. My heart aches for those people in the dark still so many days after Irene. Without juice it’s dark even at high noon inside most houses. You can’t see a whole lot in a closet, for example, even with your flashlight, and how many people have generators? Of course a stove won’t work because the spark to light it is electrical. TV and radio are out, natch, so the only sound is the creaky little string-section of the crickets coming from the yard. AND you can’t maintain very good hygiene with no water – though you do find yourself saying prayers of thanks for Sir John Harrington who, in the 1500s, invented the entirely mechanical device we now call the toilet. Pour in water, even by hand, and the thing flushes. The only challenge is you have to haul the water from someplace else to do this if you don’t want to be wasting the potable stuff on this task. In this family all we had to do when the storm hit was live for six short hours without power, then cut up the 30-foot tree that toppled at the height of the storm. But what pity I feel when I look at pictures of the destruction others have faced and are still facing! In the second-to-last chapter of The Great Gatsby, F. Scott Fitzgerald observes that there is no difference between people so great as that between the sick and the well and you could say that about a community too, the communities whose services still function normally being the obvious well ones. Look at this picture above from Winooski, Vermont. At first glance it looks like a snow field much trampled, right? Nope. 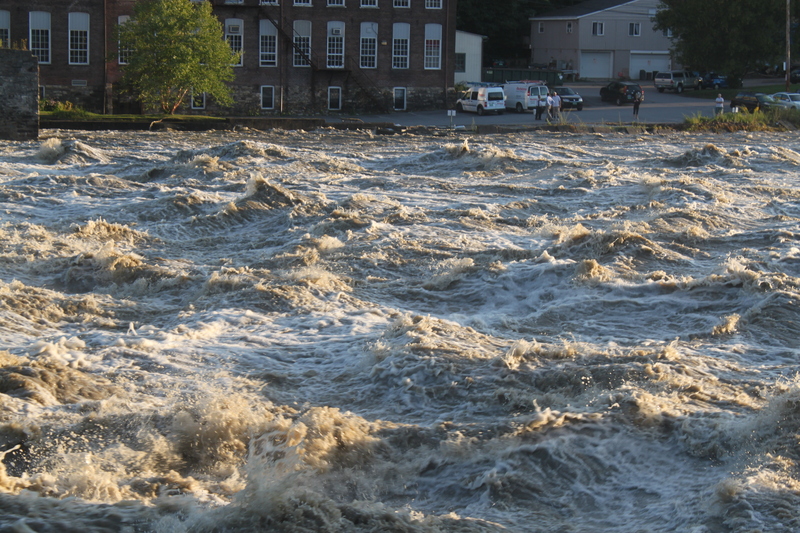 Those are the still-raging waters of the river tearing through the town of Winooski Vermont three whole days after the passing of Tropical Storm Irene. It’s chilling to see the kind of power evident in that photo and in the video below as well. It makes you realize why humans taught themselves to whistle and sing in the first place: they did it to tamp down terror. Raging waters are so compelling, and so terrifying! Glad you are all okay!